View west across Spokane St. in the early 1900s. As was the case for many urban waterways around the world, shipping and industry changed the Duwamish River dramatically. Over the last 100 years, the Duwamish has been straightened, dredged, and concretized, reducing what was 14 miles of meanders and wetlands to 5 miles navigable by all but the largest ships and barges. 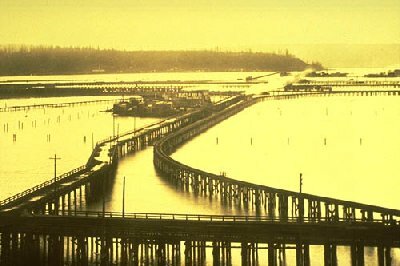 Nearly all of the native habitat - mudflats, marshes, and swamps surrounded by old growth Cedar, Douglas Fir, and Hemlock trees - were replaced by concrete factories, shipping terminals, and wrecking yards. The Duwamish Tribe, the first human inhabitants of the river, were progressively marginalized in a tragic, yet familiar series of broken agreements and land grabs by the US government and some of the area's early white settlers. The pollution resulting from years of runoff and dumping of toxic wastes led to the Duwamish's designation as a Superfund site in 2001 - a designation reserved for some of the most contaminated places in the US. Still, as a working waterway, the Duwamish tends to be invisible to many of Seattle's residents. In the late 1800s, the watershed around the Duwamish River looked quite different than it does today. Four rivers drained into the Duwamish, which subsequently drained into Elliott Bay - the Green, the White, the Black, and the Cedar. After a large flood in 1906, the White River was diverted to drain into the south end of Puget Sound, near Tacoma. The construction of the Lake Washington Ship Canal lowered the water level of Lake Washington, causing the Black River to disappear altogether. The Cedar River was re-routed to drain into the south end of Lake Washington. At this point, because the Green was the only river that continued to drain into the Duwamish, the two were actually one river. However, the portion that was dredged and straightened - the last 5 miles - continued to be known as the Duwamish. This map from the Seattle Times overlays the Duwamish of 1909 with the river's path today. Although the path of the Duwamish was constantly changing as it made its way to Elliott Bay, vestiges of some of its meanders still remain, commemorating its shape at the time it was straightened. In Georgetown, Oxbow Park commemorates an early flow channel of the river, and the historic steam plant that brought power to the neighborhood is now quite a bit inland. A pumping station for the steam plant, at Gateway Park (the end of 8th Avenue S. on the Georgetown side of the river), was installed after the river was straightened. On the South Park side of the river, Kellogg Island at Terminal 107 remains from before the Duwamish was straightened (see this Seattle Times article for location and description of the area). The boat slips along both sides of the river are all slivers of meanders, echoing the river's early days. Culture and history of the Duwamish Tribe, from the Duwamsih Tribe website. Extensive articles and some beautiful photos in the "oral history" section. The Duwamish River Cleanup Coalition is the official watchdog of the Superfund cleanup on the Duwamish, and is the best place for information on the state of the Duwamish today or how to get involved in cleanup and restoration efforts.